Praying for Rain at the Scottish Rite Temple. 1st and Topeka. Wichita. I know that I should be sketching more in Kansas. It is meditative. I sketched my way through France and it rained everyday; the Loire Valley, Morzine, Paris, Bourges, it didn’t matter, it rained. I’ve only sketched twice now in Wichita and both days it has rained while I was drawing which we sorely need. Big, juicy drops that puddled the felt tip lines and created their own thunderclouds on my drawing. I love this, it’s like felt tip watercolors. So, something compelled me to turn right at the Orpheum Theater on Broadway at First Street. 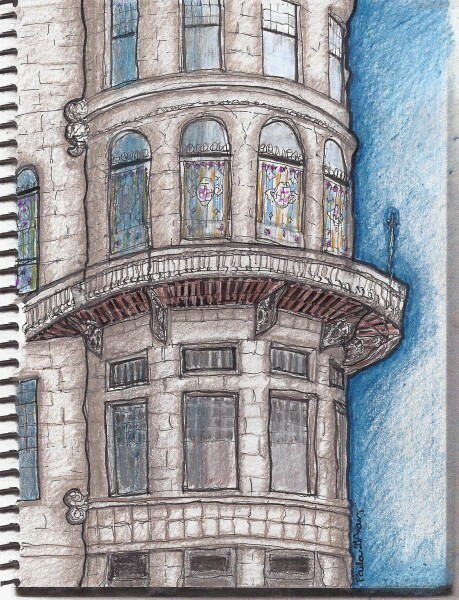 When I saw the curved wood & iron balcony on the turreted corner, there was no choice but to get out, photograph, draw. 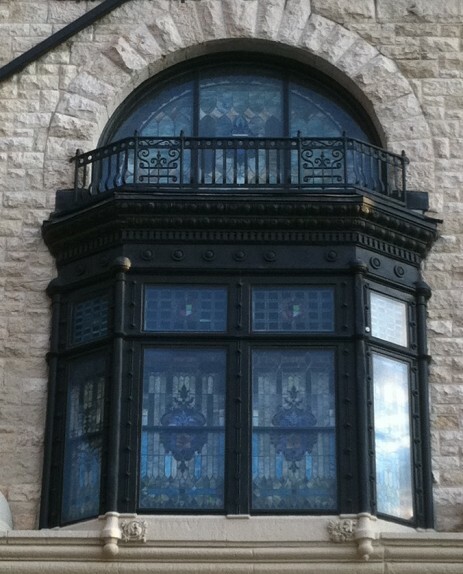 The sky was a dark blue grey, so the subtle colors of the leaded windows were vivid. The colors aren't vivid in this photo but think aubergine, aubergine, Grueby green, milky cornflower....Louis Comfort Tiffany when he was alive. And just as I was getting close to winding it up, the Rain Came! And I realized that I was at the Scottish Rite Temple. Paula's felt tip, prismacolor and charcoal of the Scottish Rite Temple. Wichita. This is all I can say about the numerous google pages I have read about Scottish Rite and Freemasonry and it’s not even my words. promises aid or charity to a member of the human family, brethren and their families in times of need if it can be done without causing financial harm to himself or his dependents. This seems like five, so maybe you only have to do three. Other than that, it was so esoteric that it eluded me, so I’ll offer no more. Temple definition: a building devoted to the worship, or regarded as the dwelling place of a god or gods or other objects of religious reverence. But, after seeing the above stated values, I guess God and Jesus (who probably never thought in terms of temples anyway) must not have a problem with this being a temple so who was I to fear it as cultish? It probably came from the DaVinci Code or some movie anyway. I'm sorry, but I still see bats and think it could be a great backdrop for Damien IV. I can imagine that God might feel, as I do, that the design of these buildings gives beauty back to the street and to the cities in which they were so painstakingly designed and constructed. Thank you Order of the Freemasons, for doing your part. 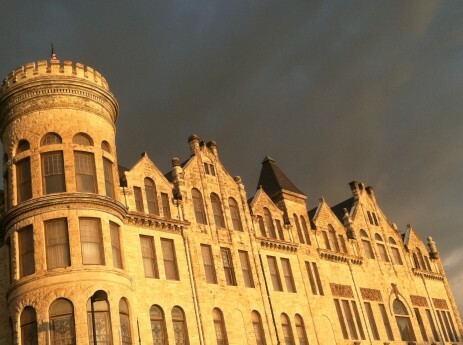 Scottish Rite Masonic Center (Temple), First and Topeka. National Register of Historic Places. 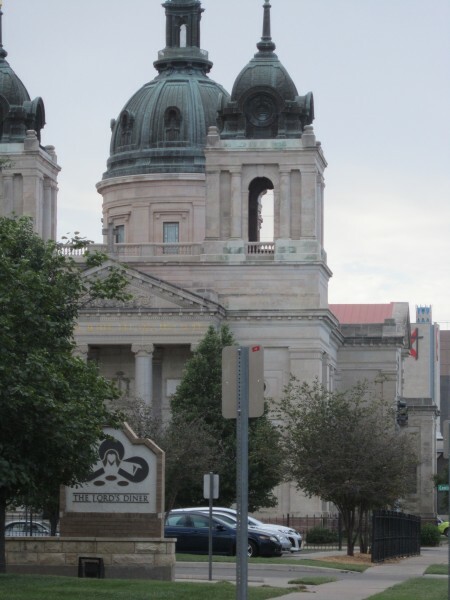 One of the six designated Historic Landmarks of Wichita. Taking my Pony on my Boat: what I share with Zeb Pike. Me and my Pony on my boat on the High Plains. What I share with Zeb Pike. I do have a few things in common with Zebulon Pike. I climb the mountains to my West. I speak French which I use in the West. As was his, my father was in the military, or at least in the Marines Corps. And, I beat the trails through Northern New Mexico quite often. This is where Pike was encamped when he was captured by Spanish authorities and taken to Santa Fe. I, too, am captured in New Mexico by Santa Fe. By the art and culture and landscape I need to nourish me on the Plains, so as to be refreshed again with its beauty when I return. And I am also an explorer of the High Plains that records with maps, drawings, pictures, people’s stories, history and research. So I understand now that this shadow at right in yesterday’s picture, made from the clear photo corner that was holding another picture, that is me exploring the High Plains by sea. When I did sail at camp, about all I could do well was to trim the jib. And that’s maybe all I will ever really take part in in regard to making money off land in the High Plains; to be the crewsman, cook the meals, drive. To suit up and be there. When I sail on this boat, it is isolated with a skilled crew, but I am somewhat of a stowaway who serves up the chow. I do share in my own way what I can, sometimes having them yacht, but often with others not on board. Not just sharing of the ranch but of other ranches, through drawings and photographs and writing about ranching in Kansas. Or in other ways like preserving a Depot that used to ship cattle or having folk artists to a one-room school near my house and inviting everyone around to come see, hear the music, and bring their fiddles. Or by inviting the real Frenchman in Kansas down for dinner and into the schoolroom to parlez with the pupils. Or having the paleontologists from Kentucky and their European interns down for dinner where I got to parlez with Sophie, the French student. I do what I love, just as those do in their jobs on the XIT Yacht. I do the work on the boat that I know how to do, that I did halfway well with what I’d been given, where I think I’m giving back. Sometimes when I would return to the main dock, I would do something stupid like let go of the main halyard. This only needs to be learned once. And sometimes I need to find a different dock. But mostly what I enjoy on the High Plains, is sailing and seeing at sea. In my books, my degrees, my work in design or preservation, in my car driving miles, in my art, I could get lost on the ocean. But, I would always be guided safely home, wherever that was for the night…Lawrence, Kansas City, Wichita, the XIT Headquarters, Santa Fe, or a hotel in a small town in Kansas when doing historical research in the field. a Lone Ranger note: I like this song, but I take issue with the one line that pits Tonto and the Lone Ranger as enemies. I feel it is a contemporary translation that lacks depth in understanding the actual details of the history of its writers. Their intent was to illustrate the common values of an Indian and a White man, to do good, and a friendship that united the pair. They worked alongside each other as practically equal partners, and had each saved the other from death at different points in their lives. Tonto’s character was originally a Potawatomi Indian by choice of the radio station owner who was from Michigan. This was a non-native to the area where he rode in Texas and the clothing is inaccurate. But, ‘Tonto’ in Potawatomi means “Wild One” and was mistaken as the Spanish word meaning fool or dumb. And, Tonto called the Lone Ranger “Kemo Sabe”, “trusted servant.” They worked the High Plains together, and would have been on the same boat. So yesterday, when I started with Zeb, I went on my sailboat journey of maps and google and Walter Webb’s Great Plains and my Master’s Thesis to try to take what I’d read and done before and make it into something short, edited and tangible. But, instead I realize I took my pony on my boat and we just enjoyed the day. through geological and rock formations, surface etching of the High Plains with rivers, glaciers, erosion. I did a timeline of government policies and actions within the 200 year span from Pike’s quote and today that were specific to the Great Plains. I even added in a tangential timeline of modes of production (technologies) and modes of transportation in relation to phases of Farming in America, but again, focused on my region, The Great American Desert. And I recorded my journey, over some familiar waters at sea, with my pony on my boat. I still do this almost every day and accept that this was the way I was made. And just sometimes it works. I zigzag back and forth at sea and occasionally hit my mark, reach the point. At other times I don’t really know where I went or where I was headed, but I did have kind of a plan, just like we did with America when Zeb was sent out to explore. And I always enjoy the journey, and record it in my memory or in some other way to preserve. I take that with me, and I leave some behind for the next guy, to do with as he pleases. This is Paula, Explorer of the High Plains. Exploration: Sailing with Paula and Zebulon Pike. From where did the sailboat begin it’s journey today? My daughter posted on this picture and I noticed that the photograph I’d scanned from my album still had clear corners at the right. I use the old school corners and Webway albums and layer my pictures for space and artistic effect, photos only, no stickers, it’s a once a year event. I organize for a day, then do Jack’s, Lacy’s, Family. Then I store any good extras in labeled manila envelopes. It’s all a mess since I’ve ripped into them with this website and blog. But from these immense prairies may arise one great advantage to the United States, the restriction of our population to some certain limits, and thereby a continuation of the union. Our citizens being so prone to rambling, and extending themselves on the frontiers, will, through necessity, be constrained to limit their extent on the west to the borders of the Missouri and the Mississippi, while they leave the prairies, incapable of cultivation, to the wandering and uncivilized Aborigines of the country. And, it is the 200 year anniversary from when Zeb Pike made this statement. Zeb Pike, a pretty good-looking guy. Well, Zeb’s prediction that we would only settle east of the Missouri didn’t really pan out. 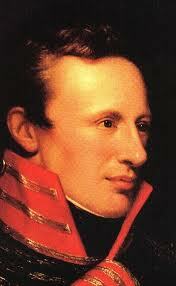 Zebulon Pike did exploratory travels through the western territories of North America. These travels included a voyage from St. Louis on the Mississippi to it’s source, a journey through the interior of Louisiana, and the north-eastern provinces of New Spain. This was in 1805, 1806, and 1807 by order of the Government of the United States. Expeditions of New Spain by Zebulon Montgomery Pike. Pike vis-a-vis Lewis and Clark. Being from Kansas City, Lewis and Clark always came to mind and their lookout point around 12th St. downtown. And, Pike was overshadowed by Lewis and Clark. But, their journals are of no value to any study of the Great Plains. Jefferson had appointed Lewis, a military man and Jefferson’s private secretary, who was also a fellow Virginian. Lewis wisely chose Clark, another military man who was the people guy, able to communicate and rally all kinds, from all backgrounds, and of all levels of education. And, he was a brilliant cartographer. But they went by water and were of eastern orientation, so they saw little of the Plains. This is not to diminish that Kansas City is the real Gateway to the West and it just now growing into its history as a food capital of the world, for it all works together. Who had more work and fun? After living on the Missouri River, on the High Plains, and having climbed a few mountains, Pike’s journey is the one I would have chosen. He had the more physically challenging and foreign work. The Great American Desert and the Mountains were absolutely that to Americans who migrated from Europe and settled in the East. And, as it is for all of us who look west, this journey is very exhilarating because it is rugged, dramatic, and difficult. 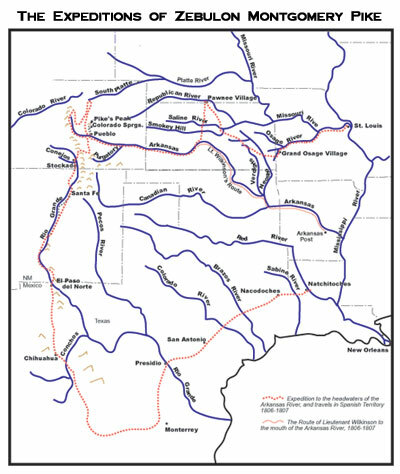 Pike’s Plains expedition began July 15,1806 in St. Louis with 23 white men and 51 Indians. By Aug. 26, he abandoned his boat on the Kansas River and went onward with horses purchased from the Indians. And he was captured and conducted to Santa Fe March 3, 1807. Governor: Do you speak French? Governor: You come to reconnoiter our country, do you? Pike: I marched to reconnoiter our own. Governor: In what character are you? Pike: In my proper character, an officer of the United States Army. So what’s the point about Pike? My point is that we did it. We took the United States. This is not a value judgment on who and why and from whom and strategy of what is good or what is bad or what is sustainable and for how long. It is on a country that studies a bit, makes a plan, does it. Be it good or be it bad, in the U.S. we got $h!t done and stepped up to the plate on how fast the world was moving and took action. And, if we hadn’t done it, or done it this way, there would have been someone else who would have. First in line, first in time in America was the open-minded people who really saw it and accepted it for what it was. This included all kinds: colonists sick of the King, indentured servants, starving immigrants, entrepreneurs with European capital from home, businessmen, and those wanting religious freedom. Good people. That is us and I’m glad we did it, imperfect as it was and is. Because the world doesn’t stop and sometimes to you have to act, to get the reins, to plow forward and do and make it better later. And that, is what I believe, is the spirit of America. And I share a few things with Zebulon Pike. I am also an explorer of the High Plains. But that is tomorrow. And, I beat the trail to Santa Fe where I am captured, as he was. But by the art and culture I need to nourish me on the Plains and so as to be refreshed again with its beauty when I return. And I understand now this shadow in the picture from the corner holding another picture, that my exploring is by sea. Sometimes when I am at sea, I am beaten by winds. Then, I know exactly what to do to get back home safely. When I did sail, about all I could do well was to trim the jib. And that’s maybe all I will ever know about really making money off land in the High Plains, to be the crewsman, cook the meals, drive. To suit up and be there. 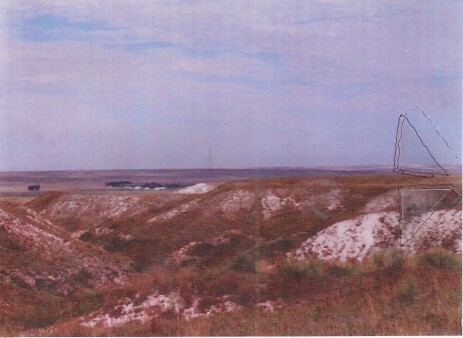 But in that private life and world of the XIT Ranch, where I lived on the High Plains, I shared in my own way what I could not just of the ranch but of other ranches, through drawings and photographs and writing about ranching in Kansas. And I shared by doing things like working on designs to preserve a Depot from where they used to ship cattle, or writing a grant to fund the work, or raising the money to help pay for it. And by inviting the Frenchman in Kansas or the paleontologists from Kentucky down for dinner. I did the work on the boat that I knew how to do, that I did well, where I think gave back. Sometimes when I would return to the dock, I would do something stupid like let go of the main halyard. This only needs to be learned once. And sometimes I needed to find a different dock. Some of it was on foot while running. For a lot of my time I had on the High Plains, I had the blessing and curse of taking my pony on my boat. I was probably not as useful as I could have been on the ranch, but there were so, so many people on that land, and it just seemed so crowded. In my books, my degrees, my work in design or preservation, in my car driving miles, in my art, I could get lost on the ocean, but I would always be guided safely home, wherever that was for the night…Lawrence, Kansas City, Wichita, the XIT Headquarters, Santa Fe, or a hotel when doing history work in Kansas. a note: I like this song, but I don’t think Tonto would call the Lone Ranger “Kemo Sabe” and not want him on his boat. They worked the High Plains together with the same values. So today, when I started with Zeb, I went on a journey of maps and google and Walter Webb’s Great Plains and my Master’s Thesis to try to take what I’d read and done before and make it into something short, edited and tangible. But, instead I took my pony on my boat and we just enjoyed the day. 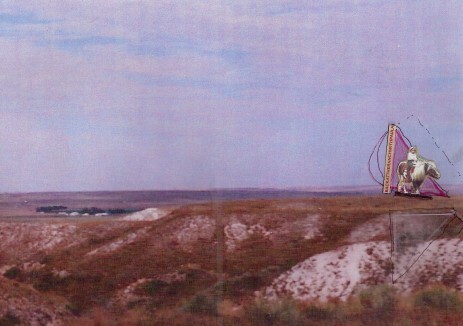 It took me through geological and rock formations, surface etching of the High Plains with rivers, glaciers, erosion. I did a timeline of government policies and actions within the 200 year span from Pike’s quote and today that were specific to the Great Plains. I even added in a tangential timeline of modes of production (technologies) and modes of transportation in relation to phases of Farming in America, but again, focused on my region, The Great American Desert. And I recorded my journey, over some familiar waters at sea, with my pony on my boat. I still do this almost every day and accept that this was the way I was made. And just sometimes it works. I zigzag back and forth at sea and occasionally hit my mark, reach the point. At other times I don’t really know where I went or where I was headed, but I did have kind of a plan, just like we did with America. And I always enjoy the journey, and record it in my memory or in some other way to preserve. I take that with me, and I leave some behind for the next guy to do as he pleases with it. This is Paula the Explorer. le sketch du jour: Sun. July 6, 1980. Beware of Italians in the Louvre admiring your sketches…. I still have flashbacks to this day at the Louvre. Especially because sometimes even now I will get myself into situations where I am thinking one thing and engaging, but realizing a little too far into it that it is turning out to be something else entirely. And, it usually starts with flattery. In particular, flattery to my work or artwork. This generally happens when I am in the field and drawing, so I am alone. If it happens before I am through with my sketch and the man lingers to talk, it has the opposite effect. I cannot talk and draw. Some Italian man probably just pretending to be an architectural engineer who admired my sketches and me, Louvre. From my journal Sun. July 6th, 1980. 6:30 pm, 1980. He walked abound the whole Louvre, not really stopping to tell me anything in depth, but speaking with the guards. So, I thought he must be a regular. Then, he started taking my hands, putting his arm around me, and would touch my face with his hands. I did not like it and it was awful, but I did not really know how to handle it. 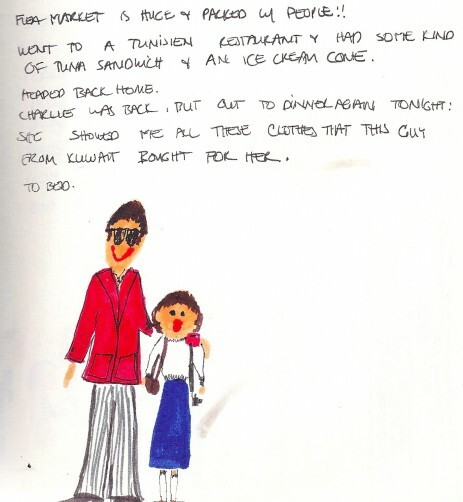 He then took me to the snack bar and bought me coffee, speaking with the employees on a first-name basis. I was embarrassed because they seemed like nice people and I couldn’t imagine what they thought of me as a young American girl who would allow an older man to touch her face. By the end of the tour, I was just trying to get away but he didn’t seem to understand. I said I had to go home, and he would say that he would take me. I was afraid to go outside. I didn’t know if he would kidnap me or what. Finally, I got away after being downright rude. It was humiliating & awful & I will never get myself in a situation like that again! Flea Market is huge and packed with people!! Went to a Tunisien restaurant & had some kind of tuna sandwich & an ice cream cone. Headed back home. Charlie was back, but out to dinner again tonight. She showed me all these clothes that this guy from Kuwait bought for her. To bed. …a woman has to be wary of a man who invites her up to see his sketches. …for a woman who provides her own drawings, she might think to be wary of the man who admires them. …unless of course, he then offers some good constructive criticism. She's not very happy and he not too with her. First, a little music for you to read by. I was a childbride, but childless & footloose for five years. A favorite courting technique, John would break into song complete with face and head gestures to serenade, emphasis on the “baay’ beh”. Even not funnier at 8 months. After a four versions on utube, I’m just starting to appreciate it all. Your selection for tonight: Classic Paul in Patchwork and Bowler. 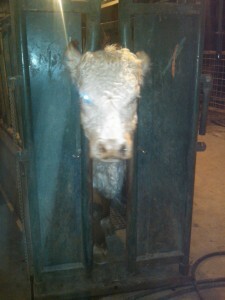 It’s the first week of calving season, John’s week on call as baby dr., so I tagged to barn at 10:30. Heifers are teen (I hope not really) cows having first calves who sometimes need a little help. They are brought in from the pastures to hang out together in the pens. Second, the excuses. It’s dark, pics in pens limited, only lights on a pole. With camera broken, I’m filming a blackberry video (I keep forgetting I can’t turn the camera sideways since u can’t rotate videos, I’m sure Steve Spielberg had to learn this too). New skills are all I can do to get unedited to utube, but this is a point in history. 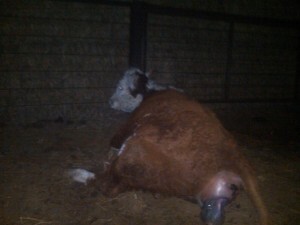 Re-location from pens to delivery room: the calving barn. I really apologize mama. My style: no cameras and leave me alone when in pain; John seized the opportunity for his usual efficiences to wash the car, pick up groceries, stop by the vet when I thought he was outside having a smoke. But, he was there at Lace’s debut at my head of the table. Pass a new baby en route to barn. Mother licking to clean and I scare but she'll be back. This is more talking about childbirth than I could ever tolerate from about 28 on. All it takes is one long-winded, detailed story relayed by some duo couple in a social situation to be enough for life. Calving chute, looks medieval I know. Construction by D. (Dave Holden) and M. (Mike Simmons), circa 1982. A stirrup, right girls? Hmmm....way up there? Think, think, Paula, before you ask engineering question. I know I can figure out the mechanics. Pretty much everything designed, mostly homemade and welded right here when it comes to stuff like this. Got her in a headlock. Dennis Knudsen, former army dr., obgyn extraordinare and Renaissance man I think would secretly love one of these for a few of his clients. A relative on John’s side out here told me (in 80s we took these funny lamaze classes pre-Lacy at local community college) he said , “ooh…kay, that’s enough of that” when she commenced with some loud hee-haws as he arrived for the delivery. Chapter Two tomorrow. The birth and some videos, more Paul. I’m sure he quit singing a while ago. Music commentary: John’s time is limited on computer, but he heard Paul singing and had to come in. Gary does his own work the best. Here he is…. The webbing material is found either discarded or on the side of the road as it breaks with wear. It is used to tie down stuff onto flatbed trucks. Gary used to drive a truck, hauling beef with Kansas-place-of-origin meatpack from the local butcher to a pastrami deli king in California. On his return, he would haul produce back to Albuquerque. Burned out on mode of transportation, but always a Cowboy on the open road. Gary will be headed to Jackson as soon as the snow’s over, so about now. I think the place where he may frequent is called the Mission. 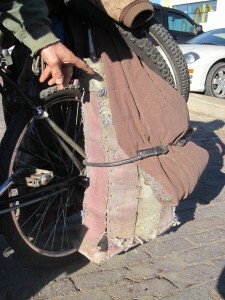 He also goes to the library which is where he saw the picture of the Canadians with the bike bags. He doesn’t do internet, but we have a date to connect through the librarian so he can see his post, Paula’s agenda, probably not Gary’s though he politely acted interested. He doesn’t have a cell, so we’ll let you know when and how we rendez-vous, but we will meet again. Paula’s pony express is on it and now I have you enlisted to help. 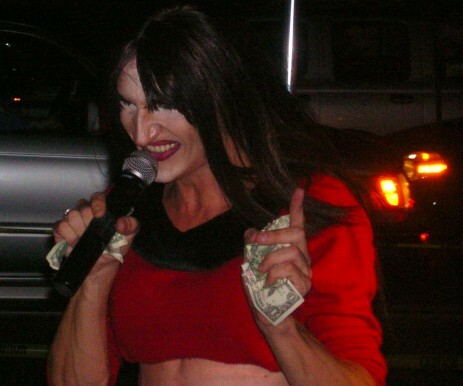 If you pass by Gary, please tell him Paula from Delano says hi. My most beautiful photo: Bus, plastic, wind, thistle. 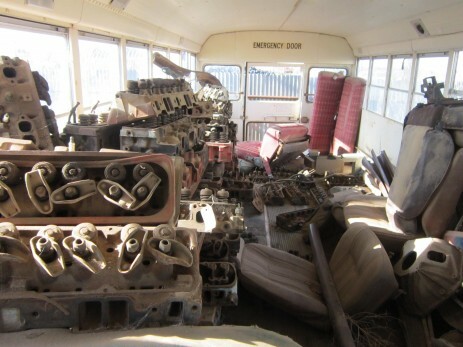 …the brown leather seats with those upright backs. 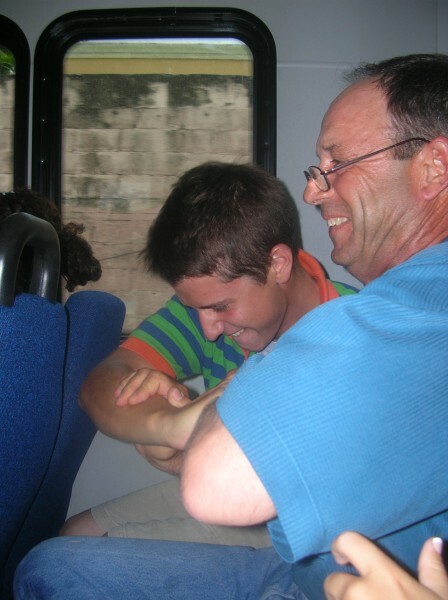 …the boys not keeping their hands to themselves on field trips. John Graves and John Charles Adams playing very hard finger twisting on bus tour of Miami Beach. …the teacher, always a fun one with great tolerance like Mr. Nickels, sauntering back to check in that everything was reasonably under control. And not exerting his or hers before heading back to the front to hang with the driver. …the incredible amount of time it seemed before we would get to a rest area as well as the incredible amount of time it took when we did stop. …Indian Hills Junior High School’ers peering out of the window at our first transvestite encounter in Washington, D.C.
Miami, 12th and Ocean. Lacy and Paula front row, Jack and John safely across Ocean Drive. Schoolbuses are good places for storage if you have a place for one in your yard. 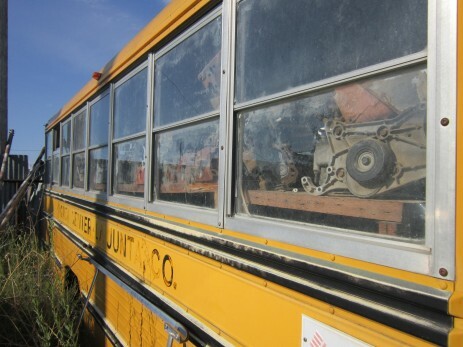 So many people in rural America can find use for an old school bus. They are built like an armored truck and seem to last many generations before losing their structure or color. They can be used to haul feed or store it. Or, to organize stuff by category as in this picture. 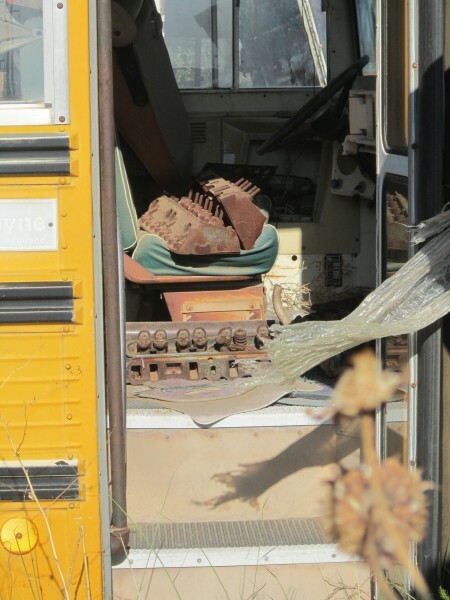 And last, memories of my children and the schoolbus. The Adams children were shepherded to and from the 28 miles from the XIT Ranch to Meade Grade School and Junior High on a school bus. It was where they played with their neighbors after school, maybe did a little homework, heard really bad language from the other kid on the ranch, and heard tales of fun badness from Jimmy Johannsen. Lacy laughed with her kind-of cousin, Carcy Larrabee who lived on another piece of H.G. Adams landholdings on the uplands of the river off of highway 23, 15 miles south of Meade. And Jack palled with Blake Larrabee, Carcy’s older brother, doing whatever boys do. Their grandparents were cousins and Horace Greeley Adams was their shared great-great grandfather. They had two wonderful drivers, Mick Friesen and Betty Friesen (not related…there are about 18 Friesen’s in Meade). They both loved and cared for my children and escorted them safely from school to my doorstep at the ranch. They were patient at 7 am being the first pickup. They were kind and appreciated Jack and Lacy for their kindness and appreciation. And, on the holidays, they gave them sacks of candy and cookies. They may have spent more time with these parents than with their own. And, I could not have been luckier to have these loving hands and hearts be there with them. Thank you, Mick and Betty. 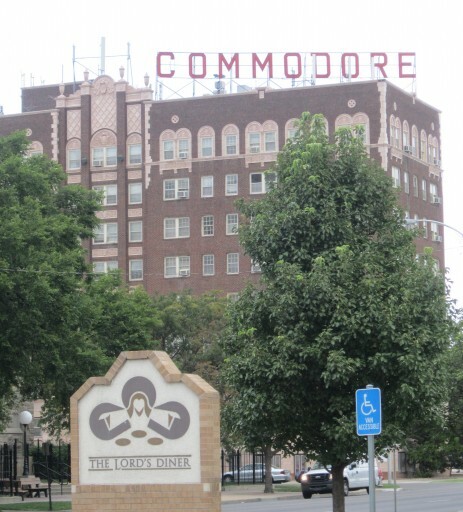 The Lord's Diner and the Commodore Apartment Building, Broadway & 5th, Wichita. The Staff of Life and Food. The Lord’s Diner is Wichita’s soup kitchen located at Broadway, just north of Central. It is a faith-based charity serving over 400 meals a day from 5:30 to 7:30, 365 days of the year, 7 days a week. It is manned by a small paid staff assisted by 5,500 volunteers of many faiths who prepare a hot, nutritious meal “in a spirit of compassion, respect, and loving service.” It is a debt-free facility built by many including 175 local companies and countless individuals who donated labor and materials. 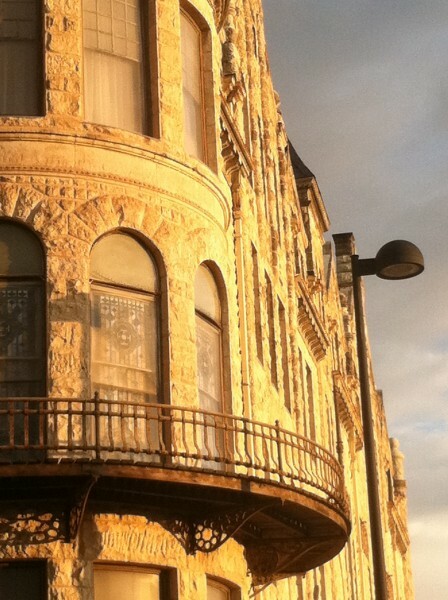 I would approach the Tulsa developer and local Wichitan who will be restoring this building to a hotel with a proposal. Let’s buy a few floors to keep back for the locals who dine at the Lord’s Diner in the evening. Schafer Johnson Cox Frey Architecture, just down the block, would work out the schematics. These are the guys for whom I worked from 2004-2006 when my daughter attended high school in Wichita. This is the floor where people, anyone, could come when life has taken them to their knees. There would be many others there who have been in this place and so need these newcomers to remind them of powerlessness. People would share, new and old alike, what brought them there. Others might share all the challenges, pain, and positives that lay beyond the adventures of the past. And, to share a gratitude for having the opportunity in life to finally reach the basement and experience the sub-grade of birth. There is a lot of work to be done on this floor, but it’s only twelve risers and the door is always open. This is a personal floor for me because the beauty is and always has been there. In the sweet manure, in the fluttering trash sack of the junkpile, in that favorite old piece of clothing hidden by new sacks of sh!t. It might be beauty to your ears, to your taste, to your eyes, to your smell, or in a smile. But, (s)he was always there with you. And, now we get to take the time to look, to really feel the depths of the happiness and pain and beauty. But this time, unclouded and still. There will be the wildly imaginative persons who need the contemplative to get the project done. And, the reverse, and everything in-between. But what is created will be taken out into the world and shared with everyone. This wouldn’t have been necessary for so many when we all came to this country. But everything’s a muscle, the mind and the body. And we are midwesterners, so it is in our genes. It takes energy to make energy and for those with too much, too trapped inside their head, it must be stoked in some form, to finally get the coals back to the right temperature for proper cooking. Those who toil physically in their daily work get a reprieve. And those who are mothers have daycare. The kiddies would workout with their peers while mom gets to reclaim her mind and body. And then, there is the dance floor. Because fun is part of life. Sometimes it’s work to plan the fun, sometimes it’s fun to plan the work. But fun is a great motivator. And, in honor of Lionel Ritchie and the building, the first selection should be “Brick House” followed by “Easy like Sunday Morning.” And, everyone has to dance, alone or together, because it is important to dance while you can. Life is short. And last, there is our past. For this, the diners must turn left instead of right on Broadway. Cathedral of the Immaculate Conception, Central and Broadway. Wichita. And this is an add-on tour, optional, but the point should still be made. Without knowing our history, we are destined to repeat it. So, no matter how painful it is to experience our own, it is a learning that is the hope for a new future. And there is a comfort in our children and our world that nothing stays the same. And all we can do is live our lives and do our work and be kind and give in a way that we have great hope for the future. Not perfectly, not with the answers, not that we’ll do it right and the screwups might actually be sweet, but thinking, pausing, and trying each day for joy, freedom, and gratitude to be alive and for whatever comes next. Here are some pictures that can tell stories to everyone, literate or not, as they have done since the Middle Ages. They are of pain and here, of people of conviction. They should be passed along. Our stories should be passed along, whether in a moment during a walk with a child or in a painting or a recipe. 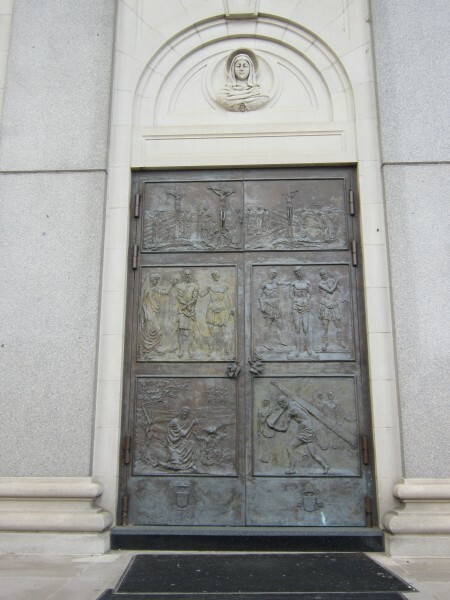 Bronze Doors of Immaculate Conception. Wichita. 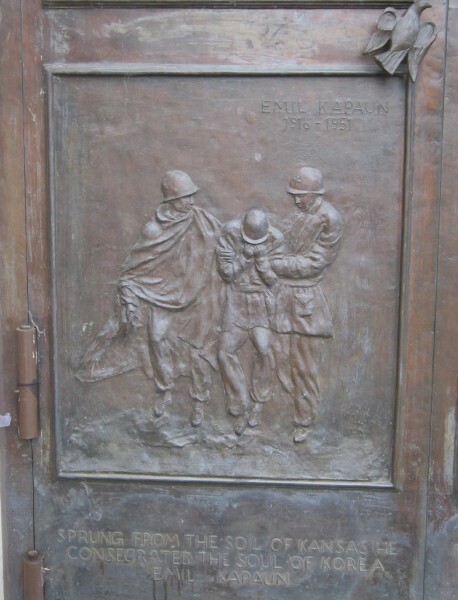 S. army chaplain who who died in the Korean War. 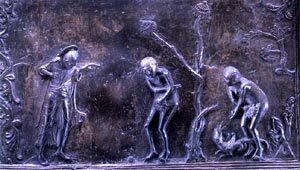 The Fall of Man: The Bronze Doors of Bishop Bernward, Hildesheim, 1025. Lower Saxony, Germany. So, I took the pictures. And I wrote a story. 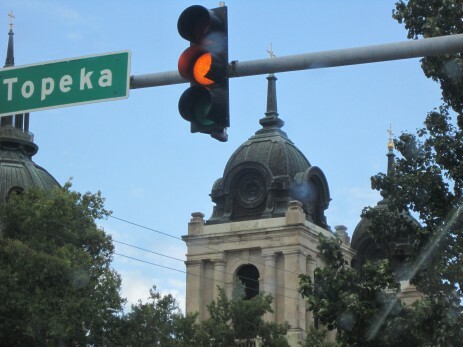 Turning left and heading east, Central and Topeka. 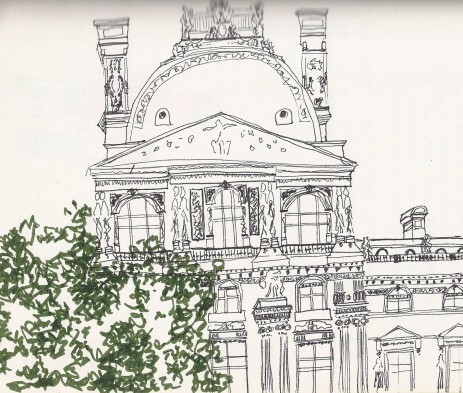 le sketch du jour: le musée des arts décoratifs and the senses of place. This is the Museum of Decorative Arts. This is where I studied the history of bone china, boulle cabinets, tapestries, French armchairs, silver, and every functional yet decorative piece imaginable with which we trap ourselves today :). and how all the low influenced the high. And vice versa. It is the north wing of the Louvre and is entered from Rue de Rivoli. The Rue de Rivoli is a famous shopping street running through Paris that was cut into the city by Napoleon and was named after his early victory against the Austrian army, the battle of Rivoli, fought in 1797. It cut into the area on the north side of the Louvre and the Tuileries Gardens, but a bit of history on these two places that everyone visits on vacation. The Louvre’s beginnings were as a fortress to Philip II in the 12th century. It became a palace during the Middle Ages serving numerous Kings, but it was François Premier who decided the Louvre would house his art collection. All the while, the Louvre continued to grow in size as a palace. It is only after Louis XIV chose Versailles as his residence in 1682, that constructions on the palace slowed. But this move to the country then allowed the Louvre to be used to house artists. Later the academy of painting and sculpture resided in the Louvre where salons were held to exhibit works and they would remain there for a hundred years. In 174,7 there was a call for display of the Royal Collection and proposals for a public gallery. And under Louis XVI, le Roi du Soleil, the Royal Museum Concept officially became policy. Thus, private art for the public domain began in France. The Tuileries Gardens were part of the Tuileries Palace that was named for the former tileworks that resided on this land in Paris just west of the Louvre. As will sometimes happen, after the death of Henry II of France in 1559, his widow Catherine de’Medici planned a new palace. Her architect was Philibert de l’Orme but André le Nôtre did not begin the formal gardens and parterres until the reign on Louis XIV in 1664. As he and later Louis’s soon departed, this left the lovely palace abandoned, to be used only as a theater, and the gardens because a fashionable spot for Parisians. So full circle, when Napoleon cut this swath through the city with the rue de Rivoli, it was a transitional compromise between an urbanism of prestige monuments and aristocratic squares and the forms of modern town planning by official regulation. This included the arcaded shopping streets of the rue de Rivoli, retail ground floor always and ideally covered. And, before Haussmann and all the later work by Parisian urban planners to make Paris the city of avenues, public monuments, squares, cafés, churches, shops, and vistas in every direction, this place began as a lookout spot. It began with a fortress and a field. And it brought together, if not the King and his subjects, his art and his beauty to share and mix with the beauty and culture of the real people. And, I think this was a pretty good idea. The building, evolving and partial planning of a city that bring a true feeling of ownership to all who are lucky enough to have this experience which can be anywhere. We all have it when we see it, taste it, smell it, touch it; the senses of place. The Gomer Bull: a story by way of Kyle Griffin, the Renaissance Land Man. 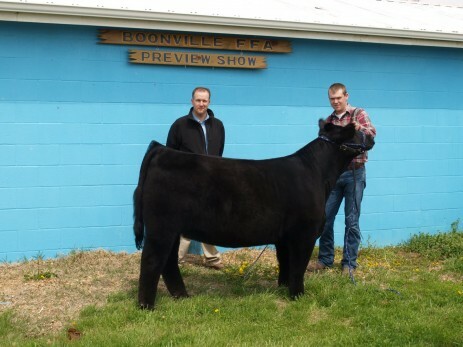 This is just some prize bull, but the guy at the right looks like Kyle Griffin who told me this story. Kyle is a land man from Oklahoma. We were finding some common ground in a Sat. morning chat in Wichita, so of course, facials at Healing Waters and A.I.’ing cattle. 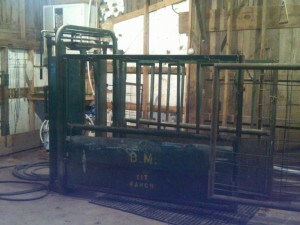 That is, artificially inseminating female cows. Kyle put himself through college performing this act, and I remember one year when John Adams did this in a specially designed chute. He was talking about the straws (they are just this, and hold the precious more costly bull juice) which I vaguely remembered. And, the window of opportunity, which I had not. He explained that this was only 36 hours. I had thought since gestation time is approximately the same as for humans, that this would be a little longer. I guess this explains why bulls get top seat for virility when it comes to money, though stallions up. But that’s another story. Just read Tom Wolfe’s Bonfire of the Vanities, no one could write it any better. Then, the discussion moved onto the percentage of implantation question and answers. This was his job both in his family’s cattle operation and as a contractor for others. This paid for Kyle’s schooling, so as with many agricultural skills, it is that (a skill). Next, came Paula’s questions about technique. It doesn’t seem to matter much (trying to draw on something in a famous novel about a women wanting a child ..Willa Cather…maybe something about a position for producing female children from a magazine…but alludes me now…). And last, identification of proper timing which does factor in. Here are Kyle’s tips for tracking the pen of females. One simple technique for identifying the fertile is watching the ladies. That is, les girls, when in their element, will actually do saddle mounts on each other. 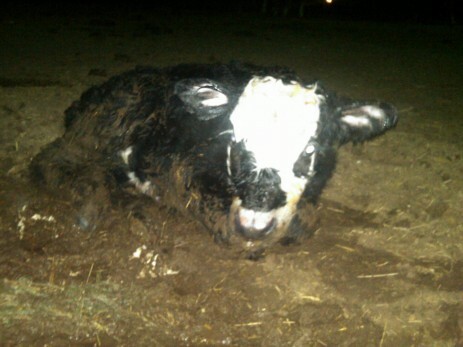 Not The Broken-d!ck XIT Bull and definitely not a Gomer Bull. Kyle knew a few more tricks to tell me about, starting with the Gomer Bull. Well, my father was in the U.S. Marine Corps, my sister born at Quantico, I, at Camp LeJeune, (the $6 babies). My father went off to boot camp in the summer to the barracks where Gomer lived in Gomer Pyle, USMC. I love that song, and I really liked Gomer best here, better than Mayberry RFD and much better than when he sang gospel and opera. He looks great in the uniform, and I thought he was well-intended (though incorrect) to encourage iron pants to be more feminine. And, he’s got one on me by accomplishing the rope course on his 3rd try, that another personal failure at SME gym class, though I excel’d at fine motor skills. Who wouldn’t love to have Gomer in their platoon? And my father, a very soft-spoken man at times, was Vince Carter when he had to do things like teach me how to ride a bike or drive a stickshift or hit a softball or shoot a basket. Still mechanically challenged as his adult second daughter, I understand now how stressful this had to have been for him, just as it was for Seargeant Carter with Gomer. 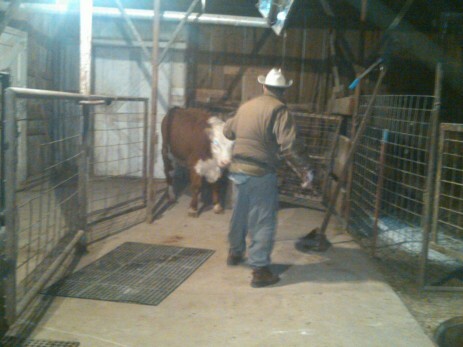 Well, a Gomer Bull is one who’s little soldier is “re-routed” (I think Kyle used) to turn at 90 degrees. Thus, if you have a Gomer Bull, you can watch for him trying to ride the cow and her acceptance. Voilà! Work is done, shepherd the cow into pen, AI and you’re done. I was concerned for the bull’s blue balls, for want of a better word. And, as I feared, he does not get the job done. Okay, back to another identification technique: K-Mars. 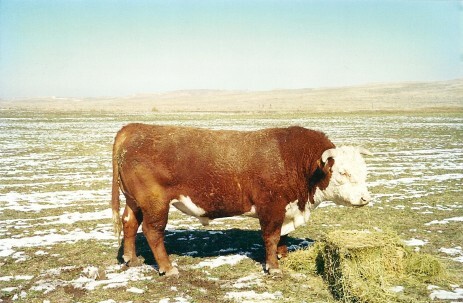 K-mars are a strip of white tape put on just above the tail of the cow. Kyle said they work kind of like those necklaces you break open at rock concerts and they light up. I was thinking more like scratch and sniff since it’s a tape. Anyway, some kind of chemical thing. Google it if you care, but you get the picture. With this taped firmly on the cow’s derrière, when bully bob is on top, the friction turns the tape orange. Bull dismounts, check tape, got’her done again. And the third technique: the roller ball muzzle. I can only envision this, and Kyle even tried to google for some pictures for me on a AI website but I have no visual. 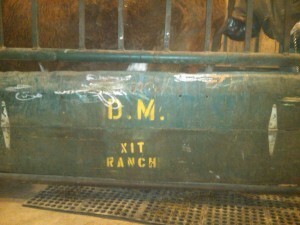 I’m thinking it’s kind of a “demi” size silence of the lambs contraption that fits over the bull’s chin. Below the chin on the mask (muzzle), is a paintball that operates just like a pen and marks everything it touches. I forgot to ask all the questions here, but in general there is lots of inhaling (these noises I’m well aware of, kind of some hawing and begging). As soon as bouche à fond (mouth to bottom), the bull leaves his mark. Once again, alerting the A-I-er that the gal open for business. Okay, that’s it. Any questions? By the way, Kyle’s friend from OSU just did the design of the bull that earned Grand Champion earlier this month at the Denver Stock Show. When I say design, he looks at all the muscling, aesthetics, confirmation, etc. of bull and pairs up with the appropriate cow, engineering the match of spermatozoa to ovum. The Grand Champion of the 2011 National Western Stock Show Super Point Roll of Victory (ROV) Angus Show was DAJS Shockwave 612, May 2009 son of Gambles Hotrod. And, it is kind of like corvettes and hotrods, it’s all show. Big time bulls like this never get to see a cow, they live in a lab somewhere owned by New York businessmen.